The Sherpa Tiny and Sherpa Tiny RoughRoader are extremely easy to tow and light to manoeuvre. We are currently looking for dealerships country-wide who will be able to show, market and promote this unique product correctly. Sherpa Leisure - manufacture and sale of small, light-weight fibreglass caravans and boat related services. Sherpa Leisure manufactures and sells the unique Sherpa Tiny caravan and the Sherpa Tiny Rough Roader caravan. 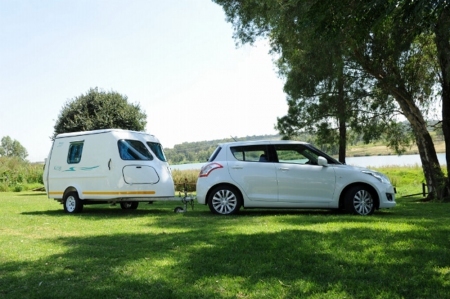 Small, compact and light-weight it is the perfect option for campers with a smaller towing vehicle. We are proud and excited to announce the launch of our new models - the Sherpa Tiny "Lite" & "Lite HiRider", the Sherpa Rambler and the Sherpa Rambler bathroom edition. Following on the success of the Sherpa Tiny and Tiny Rough Roader, the Sherpa Rambler is as strong, durable and customisable - just larger with a bit more room to move around in! Also new to our range is our Sherpa Fibretrail 1800 luggage trailer with a load capacity of 380kg. Finance is available. Repairs to all types of boats, manufacture and repair boat trailers and supply of boating accessories. A selection of new and second hand boats, trailers and caravans for sale. Sherpa Leisure now incorporates the company AluCat that manufactures aluminium boats, all types of aluminium trailers and aluminium fabrication. Please click on our website www.alucat.co.za.